Cologne (German: Köln, local dialect: Kölle) is Germany's fourth-largest city after Berlin, Hamburg and Munich, and is the largest city both in the German Federal State of North Rhine-Westphalia and within the Rhine-Ruhr Metropolitan Area, one of the major European metropolitan areas with more than 10 million inhabitants. It is one of the oldest cities in Germany, having been founded by the Romans in the year 30 BC. Cologne was granted the status of a Roman "city" in the year 50 AD. Cologne lies on the Rhine. The city's famous Cologne Cathedral (Kölner Dom) is the seat of the Roman Catholic Archbishop of Cologne. The University of Cologne (Universität zu Köln) is one of Europe's oldest universities and internationally renowned for its department of economics. Cologne is a major cultural centre of the Rhineland and has a vibrant art scene. Cologne counts over 30 museums and hundreds of galleries. Exhibitions range from local ancient Roman archaeological sites to contemporary graphics and sculpture. The city's Trade Fair Grounds are host to a number of trade shows such as the Art Cologne Fair, the International Furniture Fair (IMM) and the Photokina. Cologne is also well known for its celebration of Cologne Carnival and the homosexual festival Christopher Street Day (CSD). Cologne Sights & Events - Stadt Köln. 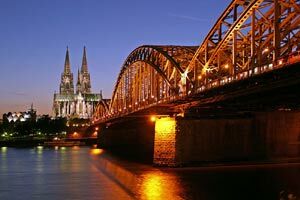 Founded by the Romans, Cologne is the oldest of the major German cities and still characterized by its 2000 years of history. Cologne has just over one million inhabitants and is the fourth-largest city in Germany. The metropolis on the Rhine with its incomparable identity annually attracts many millions of visitors. The city and people of Cologne look forward to welcoming you!